I have a good one for ya’ll this week! And yes it comes with those 3 little words everyone just trying to “get it done” wants to hear: it’s super easy! 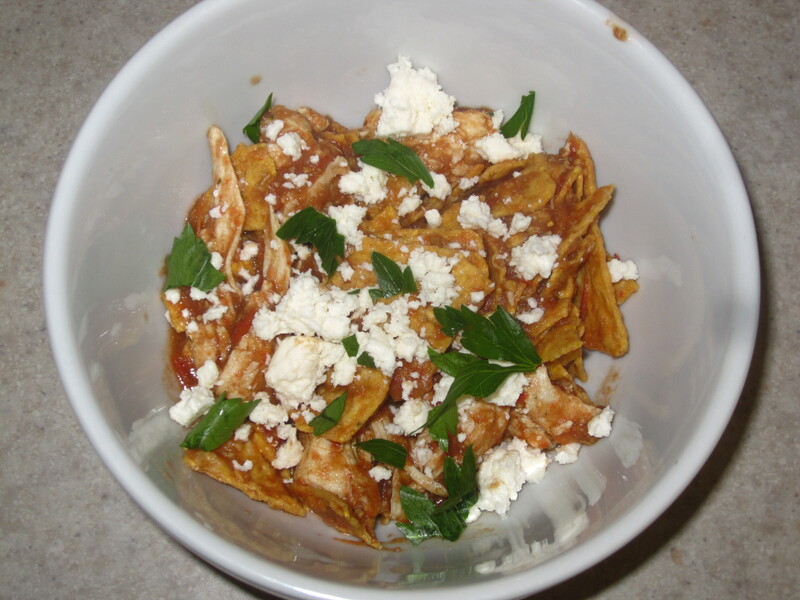 Chilaquiles is a Mexican dish that, in a nutshell, is tortilla chips cooked in salsa. Obviously from that point it can go in a million different directions. This is complete comfort food. It tastes like summer and freshness but the chips and toppings bring a luxurious feel. We are making our own salsa today – why would you use store-bought and all it’s preservatives when you can make it fresh just the way YOU want it for the same cost (or less) in 15 minutes? I am so excited to show you this dish. I love it most of all for the taste, but also for how healthy (or rich) I can make it. It’s cheap, it’s easy, and so so tasty. I made this last night for my husband and his two buddies and it was a complete home-run Another great way to serve chilaquiles is for breakfast with a fried egg on top – YUM! It’s a great way to use up tortillas or chips that have gone a bit stale too. Everyone’s had taco night, but now you can have chilaquiles night! I just love dishes that take our favorite flavors & textures and put a whole new spin on them. Any of those bigger tomatoes will do. Did you know cilantro is the fruit of the coriander seed? For the recipe-reading beginners, I want to clarify that when you see “bunch” on an ingredients list that usually means the amount you would buy in the store. For example, the carrots that are fastened or tied together are a bunch. Although it calls for leaves don’t stress on getting them perfectly separated from the stems. Just rip them off roughly or toss them in stems and all. I like 3 cloves. Most people probably like it at 2. Try a taste test! I am usually a flour tortilla chip girl but corn is so good in this recipe. It seems to keep its texture longer too. Use whatever you like – just check the ingredients list first! Kettle brand (the potato chip guys) just came out with a fantastic tortilla chip. This is my shortcut here. By using store-bought chips I cut my cooking time by two thirds. You are more than welcome to fry or bake your own. At the bottom I will have instructions on how to do both. They have so many different options on tortillas and chips that you can almost find any ingredient you want. I even saw quinoa chips in Trader Joe’s the other day! In all peppers, most of the heat resides in the ribbing and seeds where all the essential oil is. If you don’t work with peppers often, be very careful. The oil gets onto your hands and does not always come off all the way by washing your hands. I even use talc-free plastic gloves sometimes when I am working with hot peppers. I learned the hard way long ago that the oils from the pepper stay on your hands awhile. If you do it with bare hands make sure not to rub your eyes (or nose for that matter) for a few hours at least!! I omitted the heat as my daughter is six and not too into the burning mouth thing that her dad & I are. But that’s the great thing about homemade – it’s tailor-made to fit YOUR home! Topping Ideas: sour cream or Mexican crema, plain Greek yogurt, diced or sliced jalapeño or Serrano peppers, crumbled up tortilla chips, queso fresco, Monterey jack, and/or cheddar cheese, black or pinto beans, chopped tomato, black olives, fried egg, shredded pork or chicken, shrimp, etc…..
Mexican sour cream is so delicious. It is creamier and seems to have a rounder tang if that makes sense. It is also runnier than American sour cream. If I had to pick between the two I would go with crema all day long. I had some leftover chicken breasts so I just shredded them apart with my fingers and tossed them in with the chips. You can add any of this stuff right INTO your chilaquiles not just on top of. Do what you like! In a large sauce pan place the tomatoes, cilantro, onion, and garlic and fill with enough water to cover the ingredients. Add a good handful of salt. Bring to a boil and let it continue to boil for 8 to 10 minutes. And you should know by now if you have read any of my other recipes if I say “handful” that’s what I mean! Use kosher salt for this please, I beg you!! After saving and setting aside about 2 cups of the cooking liquid, drain and remove all other ingredients and place them in a blender or food processer. Blend until completely puréed. Do a taste test and season accordingly. Taste testing with recipes like this is important. We really don’t know how much salt will be needed until you taste it AT THIS POINT. If you use kosher salt you will never have to worry about it being too salty – just saying! You may not need the leftover cooking liquid, but save it just in case. But don’t add it at this point. If you are using a blender you should know that the steam released from the salsa ingredients when blended can actually push the blender lid off. I actually learned this the hard way when making soup about 8 years ago. I ended up with burns on my hands, arms and stomach. Never fear- I have come up with a safe way to do this. The handle on the lid of any older blender actually comes right off, leaving a hole for the steam to escape. New blenders usually have a spout cover that can be opened. Use a kitchen towel to GENTLY cover the opening. We’re not looking for airtight; in fact we want the opposite. It will just keep the splash in when the blender’s turned on. Pour the salsa into a large saucepan and turn heat onto medium. Toss in ½ of your tortilla chips and get them coated in the salsa. Add cooking liquid if needed (add about ¼ cup at a time). Add the water to help it coat the chips or if you need to salsa to go just a little bit farther. It’s a personal judgment call. You can add almost the whole 2 cups before it will affect the flavor intensity. Although I have never needed more than a cup I always save 2 cups of liquid just in case. Why save the cooking liquid rather than use new water you ask? Well, for one, why waste water? But also there are starches and flavors that ended up in that cooking liquid when we cooked the vegetables in it. Think of it as salsa tea. This is why it doesn’t compromise flavor intensity. Let cook until the chips get very soft and start to fall apart, then add the remaining ½ of your chips. Stir until coated and let sit another minute. Turn off the heat. We added the chips at different times for a reason. This will give us different consistencies and textures. Lot’s of different crunch levels. This was also the point I of adding my shredded chicken while cooking instead of adding it on top. Ladle into bowls, add your favorite toppings and enjoy! Preheat oven to 350°. Use 1 package of your favorite tortillas, cutting each one into 8 pieces. Lay out evenly on baking sheet. Drizzle lightly with vegetable oil (and lime juice if you like) and sprinkle lightly with kosher salt. Bake 15 minutes, flipping over halfway through. Use 1 package of your favorite tortillas, cutting each one into 8 pieces. Pour vegetable oil into skillet until about ½ inch deep. Turn heat to medium high. Allow to heat for a minute or two. Using a small piece of tortilla, check the heat by dipping it into the oil. When it sizzles, the oil is hot enough. In batches of 6 or so, fry 1 ½ to 2 minutes or until golden brown. Remove with a slotted spoon and allow to cool on a baking sheet lined with paper towels. Season with sea salt while still warm. Thank so much for visiting me this week! I hope you try this and/or any of my recipes. And if mine don’t work for you, then find some that do. Just try to do what you can. It’s pretty hard to completely change overnight. If you are just starting out, take baby steps – eventually you will get there. Try just cooking one time a week and increase as you go. And I am always here, happy to help answer any questions you have.